How Much Can You Say in One Minute? I was on a Q&A call recently and someone asked me how to put together an effective one minute commercial that would increase her bookings. These are often necessary if you’re participating in a networking group or sharing at a Chamber of Commerce meeting, or if you just want to know exactly what to say to someone who asks about your business. I came up with a cool formula that I want to share with you. This would work for a one minute sponsoring commercial as well. Name the pain – This is a simple and effective marketing technique I’ve learned and I use it in all of my marketing. What is it about what you’re offering that’s missing in the listener’s life now? For example, if you’re focused on bookings, start by identifying what they don’t have now that your products could provide. Example: if you sell cooking tools, you might say, “You know how everyone hates that question “what’s for dinner?’” or “You know how frustrating it can be to spend a bunch of time preparing a meal and then have it end up burned because your pots and pans are old?” You get the idea. So (and here’s the key to success with this), now that you have this very simple system, I’m going to challenge you to take 30 minutes and create your own one minute booking and sponsoring commercial. Then practice them until they comfortably flow out of your mouth when you need them. Need some help filling up your calendar? Grab your complimentary copy of my “Book Yourself Solid In The Next 30 Days” roadmap. It’s yours for free when you subscribe to my mailing list. Already a member of the list? My system won’t add you twice, so go ahead and grab the roadmap anyhow. Click here to grab your roadmap now! Julie Anne Jones is a sought after keynote speaker, online trainer, and corporate business consultant. She’s an accredited life and business coach with over fifteen years of experience speaking on stages across the United States and Canada. Known as “the systems specialist,” Julie Anne can break down any concept into simple, step-by-step, action-oriented training. She is known for her authentic and easy-to-use scripting and specializes in specific language and communication tools for business success. 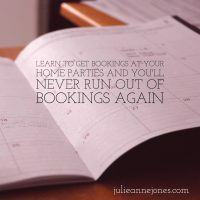 To learn more about Julie Anne and her products and services, and to read more blog posts, visit her at www.julieannejones.com.